Go to ulfirefightersafety.com for results of PPA research done last year. Some long held beliefs about PPA are debunked. Some surprising new information also. And some of the new info adds to my previous concerns over the tactic. Don't get me wrong, there's no smoking gun but still some surprising new info. I'd love to discuss it with any interested parties after taking a more in depth look at the report. As always with UL there is a lot there. I just skimmed the report. One of my old Departments used PPA and even when I was a new guy it never seemed to make much sense to me. I am currently with a department that keeps the building locked up tight until we get water on the fire, than we open it up. This seems to work well. It only makes sense with all the other data UL has put together about keeping the building vent limited that PPA is going to be a thing of the past. With PPA you are giving the fire exactly what it wants. Sure you get that initial lift of smoke and heat but that only last a fe w seconds at most before the building becomes completely involved. I'm definitely not against using fans...once the fire is OUT! It is going to take some time to read through that report, but I will do it. 1) We were always told that the entry point should be monitored and if smoke started to show at the entry PPA should be discontinued because the exhaust opening was not large enough. The research revealed that the entry opening is bi-directonal. (Apparently ALL openings cause bi-directional flow.) As is the exhaust opening. But BOTH MUST BE MONITORED CONTINUOUSY. That's two firefighters married to observation posts. I can find better things for two firefightes to be doing. 2) There was always a lot of talk about the cone of air made by the fan. And the exact distance of the fan from the entry door. Turns out it barely matters. 3) There was a lot of talk about the sixe of the entry and the size of the exhaust. The size of the entry opening where the fan is located does not matter. It is only the size of the entry door to the fire compartment that matters. 4) The size of the exhaust opening is critical. It MUST be larger than the opening to the fire compartment. A bedroom with two standard sized double hung windows is not a candidate for PPA. Because the volume of window opening is about equal to the door opening. The research did not quantify exactly what the ratio should be. I believe it indicated that 2:1 was adequate and 1:1 was not. But I believe the average American bedroom may be off the list of areas where PPA is indicated. 5) PPA is not indicated in open areas or any area with high ceilings. I don't believe they quantified how large of an area is too large. Or what height ceiling is too high. But compartmentation is a key factor. I believe many kitchen/dining room/ living room/ family room fires will not be candidates due to the fact that they are often open to each other to some degree. Even older homes are often renovated in this fashion. An outside survey will not reveal this fact. 6) I think points 4 and 5 put a major dent in the PPA tactic for many homes in America. 7) The research indicated that any disruption to the flow from the fan could allow fire to blow back (my term not theirs) in to the structure. A team of firefighters advancing a line down a hallway or advancing to search could disrupt the flow of air toward the fire compartment (remember it's bi-directional). Fire will then come at them. The idea that we can set up a fan and judge how well it is working prior to committing firefighters is not valid. Because committing firefighters can change the fan's effectiveness. This was the most surprising thing I learned. 8) The researchers acknowledge that ventilation is always a wild card. They say PPA is more of a wild card than normal horizontal and/or vertical ventilation and that it can have more negative impact than those conventional methods do. I've always argued against PPA based largely in part on what I called "volatility" of the fire area once air is introduced. 9) The researchers found that the most important aspect of PPA is rapid application of a sufficient water stream. Guess what? It's also the most important aspect when NOT using PPA. They also stress the importance of using the reach of the stream to maximize effectiveness. So why bother at all? PPA wastes time and manpower, which are all too valuable on the fire ground. It doesn't, according to the researchers, allow us to get closer to the seat of the fire before opening line. A well executed conventional attack will accomplish all the same things. Pair that with transitional attack where appropriate. The additional manpower will make the stretch quicker or the search quicker. And no time wasted setting up and evaluating the fan and it's effect on the fire. I admit my great fear concerning PPA was disproven. My fear was that it could routinely worsen fire conditions, possibly to a very dangerous level for firefighters. The researchers acknowledge the possibility of this happening. It appears that I may have over-estimated this threat. But I believe it still exists and I suspect that departments who use the tactic will not be dissuaded. I hope they are ready with quick water but I doubt it because they generally seem to endorse the wait and see what happens approach to fan operation. The conclusion for me is that since rapid water is key to success there is no other real benefit to PPA. It is IMO an unnecessary complication to the equation. It doesn't save manpower and it doesn't on it's own make firefighting safer. And it wastes time (assuming the evaluation period is honored). Civilian occupants don't have time. And if it doesn't prove successful the fire has had time to grow, making final extinguishment more difficult and less safe. I believe the conclusion for those who use the tactic will be that there is no reason to stop using the tactic. I hope they'll at least incorporate the lessons learned in to their use of it. Last edited by captnjak; 04-22-2016, 10:33 AM. Thanks for the Reader's Digest version. Let me respond by the numbers. 1) I think the critical element here is to watch the volume, color and velocity of the smoke from the entry point. 2) Fascinating. This was drummed into our heads all the way back into the 70's. 3) Interesting again, the size of entry and exhaust has been a bone of contention amongst "experts" for decades. 4) See #3. We have been told anywhere from 1/2 the size to 2 times the size of the inlet. The battle still rages here. I can tell you the last time I saw PPA in use was at a warehouse fire with a truck mounted 6 foot blades, 6 cylinder engine powered, fan in use. We had 3 loading dock doors open and it took roughly 10 minutes to clear the smoke, there was no discernible growth of the fire. 1 door 8 x 8 as an inlet, 3 doors 8 x 8 as outlets. 5) I can agree with this at a house fire with normal engine/truck carried fans. The ceiling in the warehouse I spoke of above was at least 20 feet. Fan CFM comes into play here. 7) I have seen the negative effects of firefighters in the flow path of the PPV fan. Most often it is a roll back of smoke, or just ineffectual venting. 9) DUH? Rapid water, whether from an interior attack, or transitional attack is and always has been the answer. I am not a fan of PPA, I am a fan of PPV once the fire is knocked down. I have to say that I disagree with it not having the potential to worsen fire conditions. 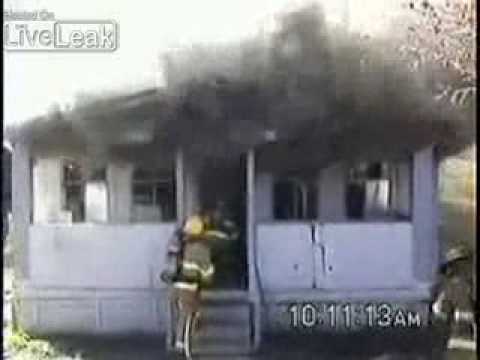 I used to commonly use PPV to clear smoke in acquired structures during live fire training. Crews would come in, extinguish the fire and I would use PPV to allow me to get the next fire going. Well, we have rules mandating a roof vent be cut, if that vent is not recovered the attic space has a sweet flow path now. Well, using my standard MO I had the fan placed and started and next thing I know because of the open attic the roof is on fire. The fan created a perfect flow path through the burn room into the attic and out the vent hole. Needless to say I took a fair ration of crap about burning the roof off the place. No more fan use at controlled burns for me. They acknowledge the negative potential. They can't really quantify it though. What I meant in my post was that they don't appear to be concerned to the level that I was. And mostly still am. I thought going in that there was a real possibility that these tests would result in a recommendation against even using the tactic. I base that on the level of unpredictability that I see in the tactic. The above video is amazing. I've seen that before. It's only about 7 or 8 seconds after the fan is started that it lights up violently. Actually, lighting up quick would be better than lighting up on a delay. With a delay, firefighters would have time to penetrate deeper into the dwelling. Occupants are screwed either way. And as always, an operating hose stream would make it all a moot point. So it requires an even more coordinated approach, more firefighters, another piece of mechanical equipment and we really cannot gauge it's success before entering the fire area? To those of us who were skeptics, it's a death sentence for pre-fire control fan use, for others I hope it at least gives them some points to study. My big hang-up has been from my perspective in the Northeast we can almost never count on a decent path from the vent point to the exhaust point as the localized climate ensures the occupants will use windows, screens, storm windows and interior doors or even temporary doors to control the flow of heat or natural cooling. This has always made it nearly impossible to use PPA as a routine tactics as it would be at a minimum "seasonal" and even then too many unpredictable variables. the finding on # 4 surprise me ----for years I was always taught that having a somewhat smaller opening , you were "pressurizing " the house and that would limit horizontal spread. My biggest concern was if you were not being 100% sure of the seat of the fire, making an exit opening in the wrong place , not to mention if there was a victim between the fire and the "exit vent" - also a lot of attic access scuttle holes have a small square of sheet rock just laying there. We have in training seen that a fan can lift it up exposing the attic. Wow. Never even thought about those half-assed attic openings when discussing PPA. They are quite common. Yet another strike against the tactic, IMO. Point number four was my interpretation of the results. Others may understand it differently. It's not like the researchers gave hard and fast rules on what to do. But I believe I was accurate. Last edited by captnjak; 04-22-2016, 08:02 PM. Sitting in an airport flying back from FDIC where the new report was a major topic of conversation with several of the NIST engineers involved in the study. It should change the way that we view PPV operations. The key is that the new study indicates that PPV is still a valid tactic in some circumstances, but those situations are limited in the modern fire environment. And that will be, for many rural departments in my area, and lkely in many places as well, will be a tough pill to swallow and will pose a major educational and training challenge. More later ..... My flight is boarding. I've used it, and it can be effective although the cases where I can definitively say it helped were training burns where the intent was to show how it can help. The real thing rarely gives you the opportunity to say if it helped or hurt unless you are unlucky enough to have a catastrophic result from its use (such as the video posted above), and of course if everything goes well it is hard to give credit because there is generally no real way to say it wouldn't have gone just as well without. Prevailing winds are another factor rarely touched on. Even a mild wind has the ability to overpower the standard portable fan. Punch those windows and you can send the fire right back at your entry crew. I've never been comfortable with policies that insist on its use at all fires, as it very definitely has the potential to do undesirable things. I do hope this study causes those who think it is the right tactic all the time to rethink their policies. Thankfully I've only worked for one department that had an always policy and fire occurrence there was very light. While working there I got chewed out by my BC on a fire involving an industrial kitchen for not using the fans. My opinion was that they offered nothing in this situation (good visibility because the smoke was entering the attic and exiting the vents) and in fact were a potential liability. This very strongly suggests that in fact I made the right decision (both at the time, and in my decision to seek employment elsewhere). I'm finding these NIST studies interesting, just wish I was in an environment where I could have a more robust discussion about them. I thank those of you who continue to make thoughtful posts here despite a lack of signs consistent with life. How did your presentation go? Year two right? I forgot to mention the wind impacted fires. Like I said, there is a lot of information in the report. It takes very little wind to upset the apple cart. This is true whether PPA is used or not. I suspect that the departments who use PPA with great success would have just as much success without using it. Add in the tight parameters for which it is said to be appropriate and I don't see it being worth the time, energy or money in equipment and training to bother incorporating PPA as policy. Plus the report is clear that there exists plenty of possible negative consequence to the tactic. With no more real upside than a traditional aggressive attack by a well trained engine company. Went very well. Evaluations were pretty solid. And yes, it was year 2.